When I was a kid, I loved pizza. Growing up in New Haven, Connecticut, there were so many great pizza restaurants around. At the time, I didn’t realize how special they really were, and how difficult it is to create a great pizza. The secret, I found out, is in the spicy sauce and thin, crispy crust. New Haven pizza requires more time and expensive ingredients in my opinion. For instance, you can taste the sauce and actually SEE it in the pizza. 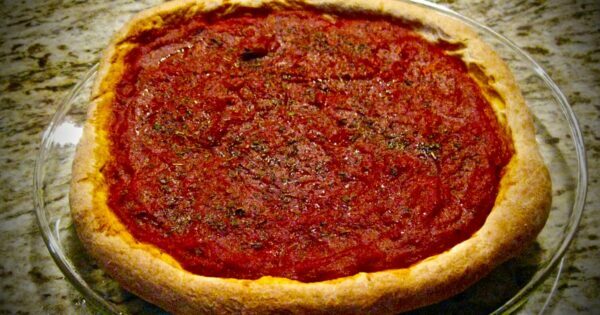 In fact, the sauce is often so good that a popular New Haven Pizza is plain – no toppings – just the sauce. In cheap pizzas you’ll often see just gobs of cheese covering a little bit of sauce. Maybe New Yorkers care more about speed and money… for me, I’ll take a New Haven pizza. New Haven pizza also often has a little bit of charring… the ovens make it delicious. For the home baker, it probably won’t be possible to achieve the charring because home ovens don’t get very hot, but we can get a little close. My deceased grandmother loved to make sauce. My family would grow fresh basil in the backyard and use it in the sauce. Oftentimes sauce is what makes for good Italian food. Fresh ingredients and strong spices make it stellar. Since I moved to Texas a few years ago, I haven’t been happy with the local pizza. I decided to put on my oven gloves and take it to the kitchen, making my own pizza – the way I remember it from my childhood. I don’t own a New Haven pizza restaurant and clearly different restaurants will have their own take on what is New Haven Pizza, but through my years and years of making pizza this recipe is the closest I’ve come to replicating the regional taste at home. Use non-stick spray in a large stainless steel bowl to keep flour from sticking to the bowl. Heat 1 cup of water to 120 degrees. For me, 1 cup of water in a 1400 watt microwave for 30 seconds at full-power works. You DON’T want the water too warm or it will kill the yeast. Mix warm water, yeast and malt (or sugar) in the cup of warm water. I use a measuring cup to mix the yeast with the sugar. Let sit for at least 5-10 minutes. You should see about a .5 inch foam top form due to the yeast. If no foam starts to generate after a few minutes you either killed the yeast with hot water or the yeast is no good (they do expire – check the package). Mix flour with olive oil and salt. Add the warm water / yeast mix to the large bowl. Stir with a large spoon. When the mix starts to congeal, rub it into a ball. Cover the ball of dough with the mixing bowl and let the dough rise for 4 hours. Follow the ingredient amounts exactly. If you do, no adjustments will need to be made. If the dough is too dry, add some more water. It may also need a little more olive oil. If the dough is too wet, add more flour. Knead the dough until it has a nice consistency – not too dry, not too wet. Leave the dough in the bowl, cover with a towel or plate for at least an hour. Smash the whole tomatoes with a dusting of oregano and garlic powder in a sauce pan. Place stove on medium heat. Also the wood or coal-fired oven found in the restaurants give it a really unique taste. Some restaurants will use a lot of oregano — so much so that you can see it everywhere in the sauce. You can use a little garlic but beware –garlic is very potent and just a little too much can ruin all the sauce. After 10 minutes on medium heat, adjust heat to low setting, and cook for 1 hour. Stir constantly and taste. Use a wooden cutting board to knead the dough. There will be enough dough for 4 small pizzas. New Haven style pizza is very, very thin. It can be difficult to get dough very thin. Just keep kneading and flipping the dough. Press with your fingers in an outward motion to stretch the dough on the cutting board or pizza peel. If you can start to see through the dough you’ve stretched it too thin. Place some cornmeal on a pizza peel. This will help it slide off the peel (and adds a bit of flavor). When the dough is thin enough and in a pizza shape, place it on the spatula. Use a large spoon to put the sauce on the dough, spreading it evenly.Like I mentioned before, sauce is important in New Haven. Add as much as you can, but be careful not to weigh down the pizza too much or you won’t be able to slide it off the pizza peel. You can add toppings; however the sauce is the star of the show and the San Marzano tomatoes give it that sweet taste that goes perfect with a charred crust. Rip chunks off of the block of whole-milk mozzarella cheese. Space cheese chunks evenly on the pizza. They don’t need to look perfect as the cheese will melt and spread. Add pepperoni if desired. Place the pizza on a pizza stone. Pizza screens are more durable than cheap pizza stones and help the heat flow through for a crispier crust. Pricer pizza stones are great but need to be thick to be durable and need more time to to preheat in the oven to get hot. New Haven style pizza crust is a little crispier than average pizza with char, and the thin crust will also make it crispier. Preheat oven. Place the pizza in the oven for 13 minutes at 500 degrees. Rack position may affect crispiness. If adding cheese be careful not to place it on a high rack otherwise the cheese will burn. Keep an eye on the pizza in the final minutes of baking. Add basil leaves and crushed red pepper after the pizza is done if desired. Some of favorite pizza restaurants in New Haven include Frank Pepe’s and Modern Apizza and Tolli’s Apizza. Also, wash the pizza down with some unique soda from the area Foxon Park – my favorite is White Birch. Be sure to stop there when you in town. Traditionally, we would need a coal-fired oven to make these pizzas. You’ll notice that most pizza restaurants add just a little bit of sauce and smother the pizza with cheese. Not the best way to go in my opinion. New Haven is renowned for its pizza, and it is also a favorite of President Clinton and other famous people. I hope you will enjoy this recipe and make this pizza from a small city in Connecticut a big part of your family life. Frank Pinello discovers New Haven pizza or “Apizza” in this documentary. two questions— after making the dough do you let it rise at room temp, or put it in the fridge. and second, at what point do you make four small doughs from the large ball. 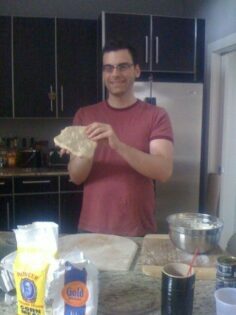 I cover the dough with a glass plate at room temperature. The warm water keeps the dough warm for a little while, so you don’t need to put in an over or anything like that. Don’t put it in the fridge unless it’s already risen for a while. I wouldn’t put it in the fridge at all. When the dough is risen then I will make a fresh pizza, and then knead the dough again, and when I am done with the first pizza I am making and eating I will make the extra crust and then freeze them. 4 cups of flour worked out for people? For mine it was much too dry. Making adjustments. If it’s too dry just add more water. It’s not exact all the time. I don’t know why, but sometimes it’s too wet or too dry. It should be more wet, however. I find if it’s too dry it won’t turn out right. Thank you Ken… I don’t gotta problem wit that 🙂 Seriously, thank you for the NH recipe. I’m making’ NH style apizza with mootz shortly! Thank you, Chad! Yes, the “mootz” (mozzarella) is the way to go. I grew up in North Haven and recently moved to North Carolina and haven’t found a single pizza place close to the quality of somewhere like Modern or Pepes. Can’t wait to try this out! Now that the economy is improving I do notice a lot more gourmet pizza restaurants popping up in Houston. I would think it would be the same in the rest of the country. I am now able to order ingredients from Italy on Amazon. I updated my recipe and ingredients. Check it out when you get a moment.